Pre-season Formula 1 testing finished with a flourish from Mercedes and they look in decent shape ahead of the new season. 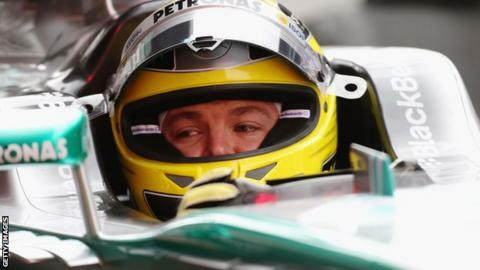 On the final day of the test, Nico Rosberg backed up with his own pace-setting lap the impression given when Lewis Hamilton set the fastest time on the penultimate day. Rosberg was 0.428 seconds faster than Hamilton had been but you would expect that given that the track would almost certainly have been in better condition in that period and Mercedes would have been improving the car all the time through their 12 low-fuel runs. Rosberg achieved his time on a one-lap run whereas Hamilton's was longer. If you take away the extra laps Hamilton did in terms of the lap-time effect of the fuel on board, Hamilton's time closes to within 0.156secs of Rosberg's. That's very close and well within the sort of margin you'd expect from the set-up and track-condition improvements. Testing times can be notoriously misleading, but this appears to be genuine pace from Mercedes. If you look at the lap times they did on longer runs, they correlate almost exactly with the lap-time difference you would expect given the extra fuel on board. The car looks genuinely good on the track and I'm sure Mercedes will be close to the front in Melbourne on 15-17 March. Ferrari's Fernando Alonso split the two Mercedes drivers' times and that car is obviously in the ballpark as well. In terms of ultimate pace achieved over the winter, those three drivers are standing on their own but the identity of who looks quick has varied from day to day so that doesn't necessarily mean a great deal. The most difficult team to read are Red Bull. They brought some new parts to the final test and on the final day they had them on and then off again. Sebastian Vettel said afterwards that they had not managed to get done everything they wanted to in the course of testing. But reading between the lines, we do know Red Bull run quite a lot of fuel in the car throughout testing; they never go for glory. I have worked out what I think that fuel load was based on the difference in pace between the Red Bull in pre-season testing last year and what it did at the first race. McLaren do the same as Red Bull, although perhaps not to quite the same extent. Watching out on the circuit, the Red Bull looks very strong. The Mercedes also looks good. And the Lotus is consistent. Watching at the long, uphill quick right-hander at the Circuit de Catalunya's Turn Three, the Ferrari looks quite stiff at the rear. Whereas the McLaren's weakness through there is the front end. The McLaren still has the inherent understeer it has had since the start of pre-season testing. The Ferrari, meanwhile, looks very planted and strong on a one-lap run on new tyres but once the tyres start to go away it tends to start kicking the rear out. Overall, it looks like being a great season. The field looks very tight and we will not know who is going to be on pole until we get to Melbourne. And after qualifying, things might be different again in the race. And this is where McLaren might have a problem. Their race pace has not looked very good at all at the two Barcelona tests. Why that should be, given that they looked stronger on high fuel at the first test in Jerez than on low fuel, I don't know. It is one of many mysteries that make the level of anticipation ahead of the start of the new season all the higher.